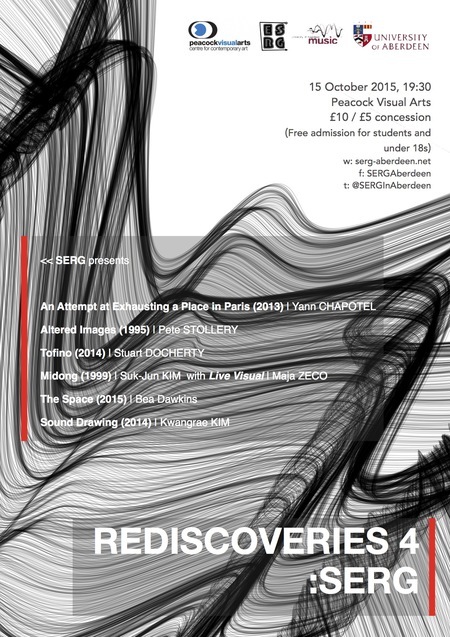 Rediscoveries is a new series of performances of electroacoustic music and sound art events, presented by SERG (Sound Emporium Research Group)from the Department of Music, University of Aberdeen. A new iteration of the Discoveries series which dates back to the early 1990s, the series will allow audiences to (re)discover works from all over the world. This fourth concert features works by SERG members, including an audiovisual work by Yann Chapotel and live visual performance by Maja Zeco.